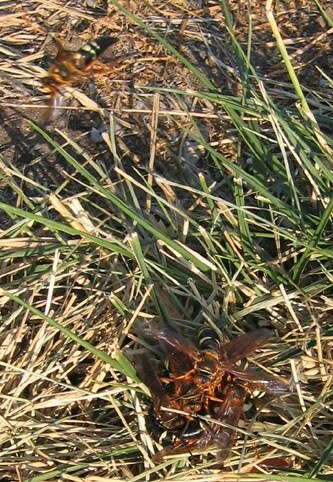 For at least the past two years, an unassuming island at the township parking lot has been the home of cicada killers. It sounds like a fearsome creature, and its looks and size are not reassuring. 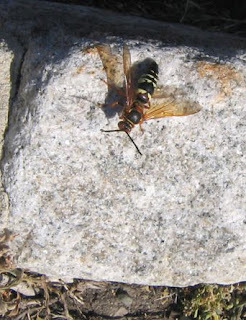 But the male wasps that now buzz around low to the ground cannot sting, and the females are very reluctant to. In the morning, at least, the males take time out from chasing each other to alight on vegetation or on a curbstone for a few moments, their abdomens pulsing. They overwinter as larvae in underground burrows. After emerging as adults, they survive on nectar from flowers. The females, which are somewhat larger than the males, will spend the summer snatching cicadas from the air. 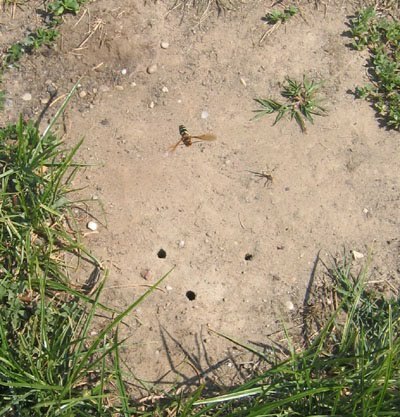 They paralyze them with their sting, then drag them back to underground burrows, where the cicadas serve as food for raising the next generation of cicada killers. 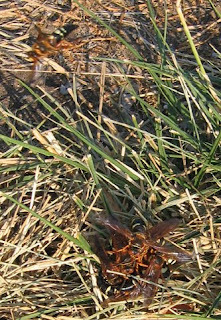 NOTE: July 5th, I noticed a cluster of wasps on the ground (lower right corner of photo). 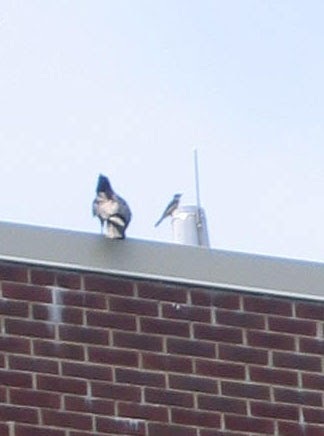 Information I found on the web describes this sort of clustering to be several males who clutch a mating pair. A few days later, I noticed that cones and warning tape had been erected on the island, apparently as a way to keep people away. Hopefully, the wasps will be allowed to continue living there, since they show no inclination to bother people walking by. NOTE: Today, July 9, I learned that the wasps had been treated, due to complaints. It was an unfortunate combination of the two parking lot islands being in an area of high foot traffic, and the wasps' breeding success. Their numbers grew from a few last year to dozens this year. NOTE: As of July 20, cicadas are singing and the cicada killers are back to their buzzing around at the Community Park parking lot, despite any treatment two weeks ago. 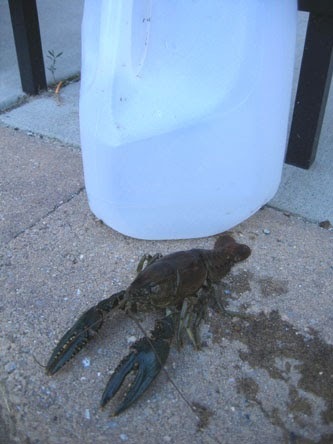 They reportedly hatch progressively through the summer, so any treatment's effect would be temporary. 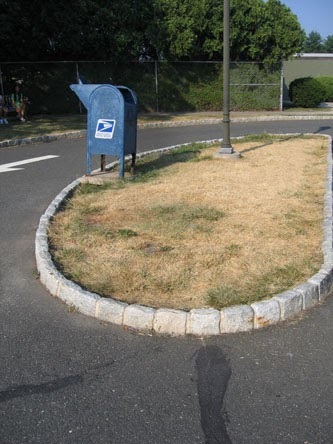 The sparse grass and full sun on the parking lot islands is perfect for them, and they don't seem to be doing any harm. UPDATE, end of July: Oops, all gone. Nada mas. 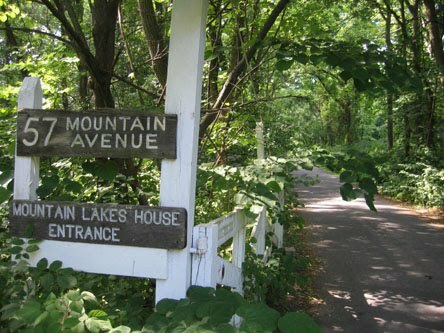 The long driveway at Mountain Lakes Preserve more often serves as a popular walkway for Princetonians seeking a peaceful walk with child, dog, friend or cellphone. That peacefulness will be elusive during weekdays from early morning to late afternoon as various construction projects get underway. Last week, crews cut back the (mostly invasive) shrubs lining the driveway, and this week a new sewer line is being extended to the house. In July, still more trucks will be using the driveway as a contractor begins restoring the dams and dredging the lakes. The public is encouraged to avoid using the driveway, and instead explore nearby trails to the left and right of the driveway entrance. 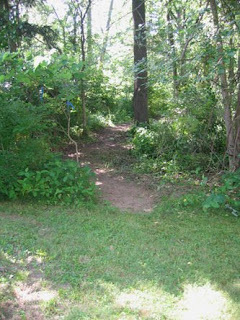 FOPOS volunteers built a new trail that heads into the woods about 100 feet to the left of the driveway, and various trails--paved and dirt--can be found leading off from the Community Park North parking lot just to the right of 57 Mountain Ave.
Construction will occur in phases, over a period of 15 months. On June 19, the Princeton High School ecolab wetland was one of the stops on the Green Building and Garden Tour, organized by the Princeton Environmental Commission. The intention of this tour stop was to focus on how a retention basin can be converted into wetland habitat, but an airborne drama pulled our attention skywards. 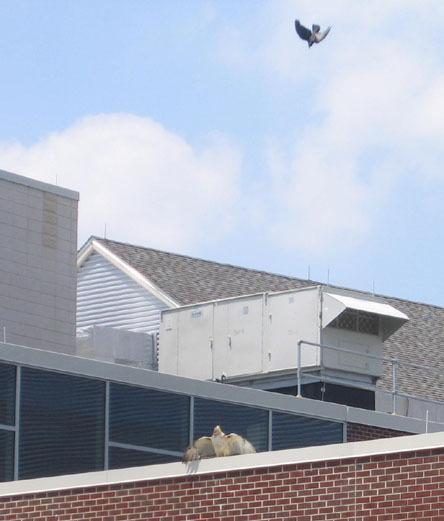 A red-tailed hawk flew over from Westminster campus, chased by a pack of crows. 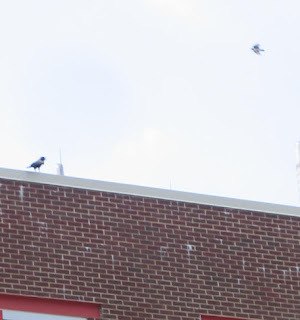 The scolding and intimidation continued for several minutes, as the crows took turns dive-bombing the hawk. 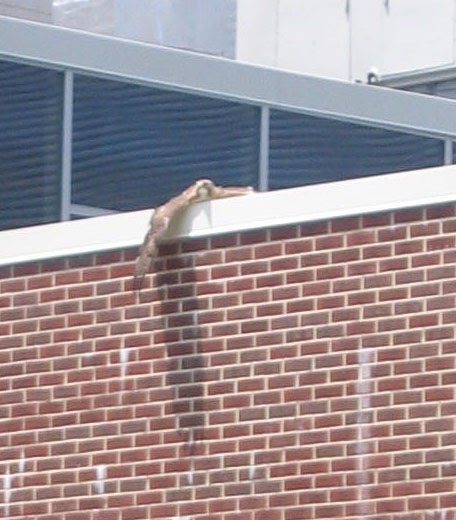 The hawk kept an eye out, but seemed generally unconcerned. They'd all been through this before. After the crows left, the hawk lay down and draped its wing over the edge of the roof, as if injured, or simply wishing to gather some warmth from the sun. The crows returned, the hawk flew off, but one of the crows hung around long enough to in turn become the target of intimidation by a still smaller bird with white markings on it tail. During summer break, it's feistiness rather than size that makes for a schoolyard bully. 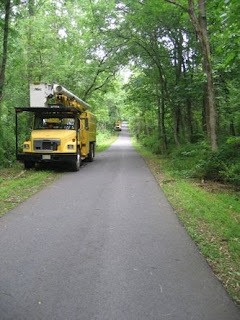 Earlier this month, I received an inquiry through the www.fopos.org website, asking if there was a park in Princeton where a couple could plant a tree in honor of their newborn son. I suggested Potts Park, which is right behind my house and is in great need of more shade for the play equipment. 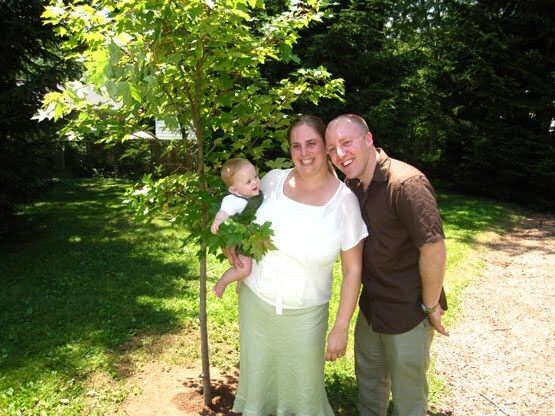 On June 19, with friends and family on hand, Rebecca and Derek planted "Charlie's tree", an October Glory red maple. Borough council member Barbara Trelstad located a suitable tree at a local nursery, and coordinated with borough staff to have a hole dug prior to the ceremony. I'll be doing the watering. Though the couple doesn't live in town, Rebecca describes herself as "a proud graduate of Princeton public schools and PHS." Her parents still live in Princeton township. Thanks to Rebecca and Derek for this wonderful gesture that will add to the pleasure of the park for decades to come! What to Do With a Cattail Patch? This section of the high school wetland was packed with cattails a year ago. Cattails are native, and provide good habitat for redwing blackbirds and other wildlife, but if left unchecked they would soon take over the whole wetland. Their spread, via rhizomes and seed, has added to the maintenance required to sustain a diverse plant community. A combination of repeated cutting and pulling of the cattails freed up this area for less aggressive natives like pickerelweed, arrowhead and wild rice, all of which need consistently wet soil to thrive. The last stronghold of cattails is this one small corner of the wetland. After talking to Tim, the ecology teacher at the high school who I collaborate with to maintain the wetlands, we decided to cut down this last patch. After I did so one evening, a good friend who knows edible plants happened to be walking by and stopped to say hello. "Why don't you eat them instead of just cutting them down? ", he asked, and then went on to explain how to eat them raw. I tried one, and found it to be unexpectedly tasty. An internet search later on yielded info on five ways to eat cattails at different times of the year. 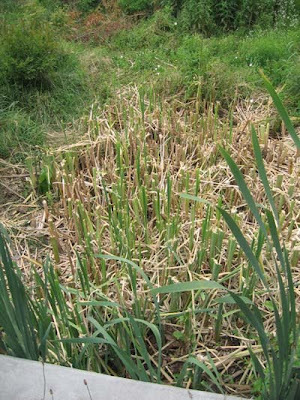 Here, then, is a new approach to maintaining ecological diversity by keeping cattails in check through ongoing harvest. Two dimensions of environmentalism--Eat Local and Habitat Restoration--meet over a helping of cattails. This Saturday, June 19, a highly bikeable tour of "environmentally smart approaches to building, landscaping, gardening, and managing waste" in Princeton. 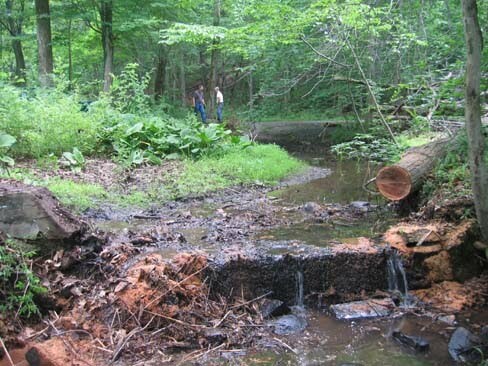 This event, from 11-3, was organized by the Princeton Environmental Commission. 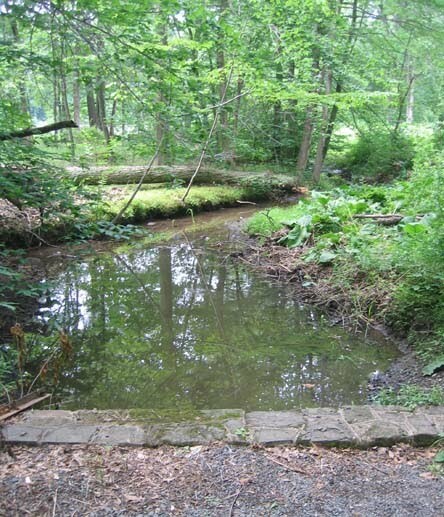 Check out the map and descriptions at www.sustainableprinceton.org, and visit the stops in any order you choose. Two garden installations that I helped start will be on the tour. 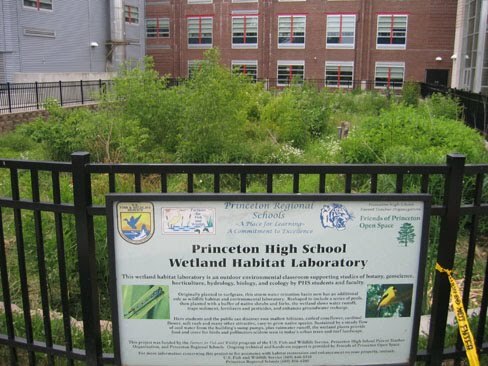 I will be at the Princeton High School ecolab wetland from 1-3 to offer plant by plant commentary, and will be putting up interpretive signs there and at the Harrison St. raingarden this week in preparation for the tour. 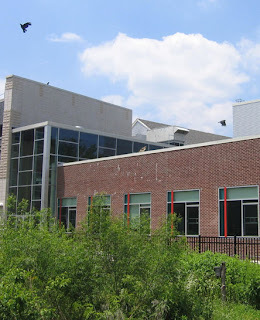 A new raingarden I installed this spring is not on the tour, but can be found in front of the Whole Earth Center on Nassau Street. The extraordinary gardens at Riverside Elementary will also be on display, as well as the fine facilities at D&R Greenway for growing native plants. The magical mystery sump pump that feeds water from the high school basement into the wetland. It comes on every twenty minutes or so, regardless of weather--a humble but highly beneficial version of Old Faithful in Yellowstone Park. which grow to considerable size. Silky dogwood is one of the shrubs, planted on some of the higher ground in the wetland. Other shrubs include: elderberry, indigo bush, swamp rose, buttonbush, winterberry and red chokeberry. Blackhaw Viburnum, a more upland species, also grows here on relatively high ground. 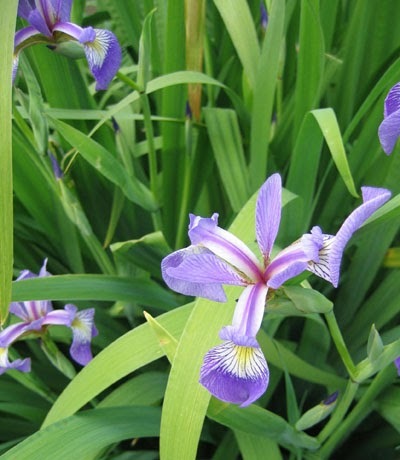 There's lots of blue flag iris planted here to show off this native that is seldom seen growing in the wild. The yellow flag iris, common in Princeton's wetlands, is an introduced species. shocked!.......to find ripe blueberries in my backyard. 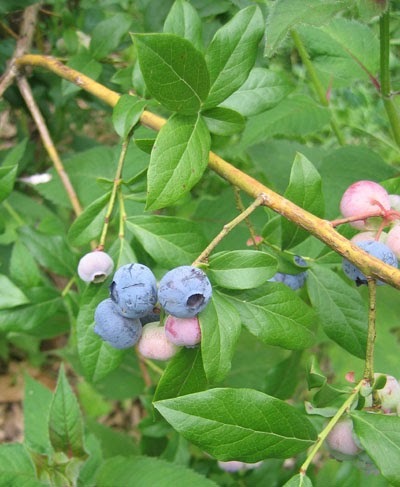 For some fifteen years now, in two yards in two states, I have grown blueberries without any expectation of edible results. Many years, I didn't even bother to check. It was simply assumed that the catbirds and their surrogates, exercising due diligence, would deprive us of any harvest. So it took a few moments to digest the meaning of those congregations of blue that caught my eye while passing by. Some hours later, it occurred to me that my visits to the backyard this spring have not been accompanied by the accustomed complaints of a catbird that in past years had frequented the bushes along the back fence. Those bushes, overgrown, had been given a radical pruning this spring. It's a tenuous cause and effect, to be further contemplated while munching on the fruits of nearly forgotten labors. Recess gardening could be gardening in small recesses of one's yard, but here it has to do with kids spending their recess doing gardening in the school courtyard. 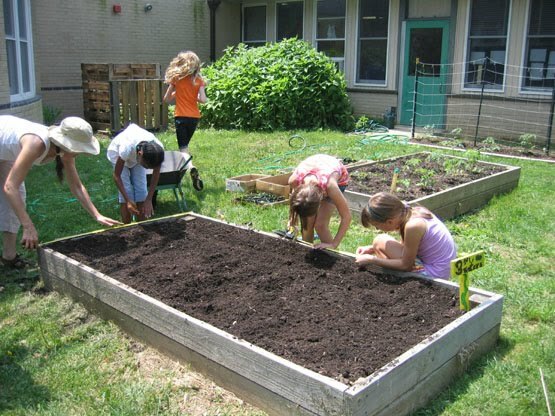 The courtyard is a fine space where plants can grow unfettered by deer, rabbits or groundhogs, and where children are clearly discovering the satisfactions of working with the soil. In the first photo, the kids are exercising their math skills to space out plantings of the "three sisters"--corn, squash and beans. Knowing well how reluctant kids can be to eat green vegetables, I was amazed to see the feeding frenzy in the edible pod pea patch. The only sort of encouragement needed was an admonition to leave some for the next class. 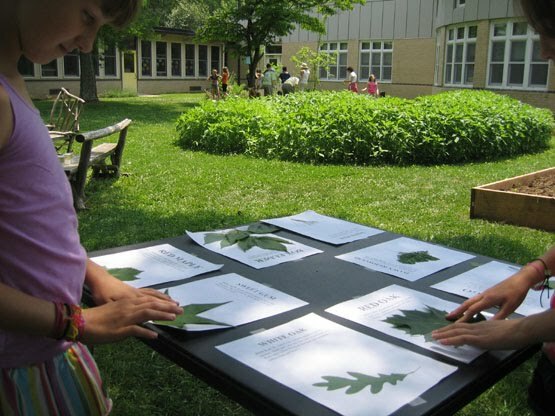 My contribution to this science day event was a tree identification table, where kids could match real leaves to color copies with name attached. It was a chance to talk about opposite and alternate, rounded vs. toothed lobes, and simple vs. compound. 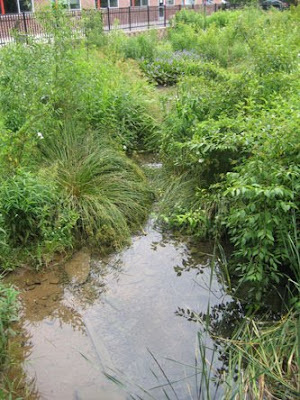 In the mid-ground of the photo is a rising mountainette of Jerusalem Artichokes (the native tuberous sunflower), which surround a little pond. We need to remember to harvest the tubers over the winter. Otherwise, they come up much too densely. In the distance is an herb garden that kids were building a decorative fence around, made of woven wild grape and Virginia creeper vines. 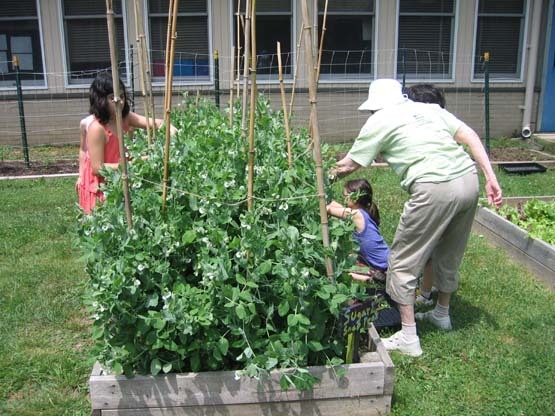 In its third season, the schoolyard garden is thriving, thanks to the many parents and teachers involved, and the energy and interest of the kids. 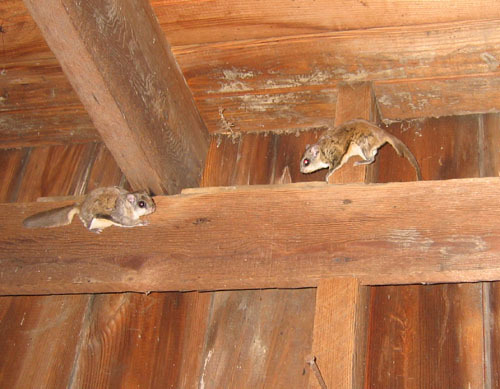 My flash makes this look like a museum exhibit of stuffed mammals, but these are two in a family of flying squirrels that we found a month ago living in the small barn located next to the Veblen cottage. One of the cuter rodents around, they are more common than one might expect. 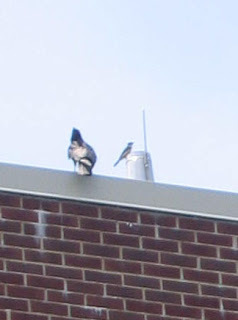 In addition to sightings at the Veblen farmstead, they've been seen in an old birdhouse at Community Park North, and even gliding over the patio behind our house on busy Harrison Street. When the restoration of the Mountain Lakes dams gets underway in early July, this peaceful spot will become a muddy, makeshift road for carrying 100 years of sediment away from the upper lake. In other words, it's time for any self-respecting wildflower to pick up and run. 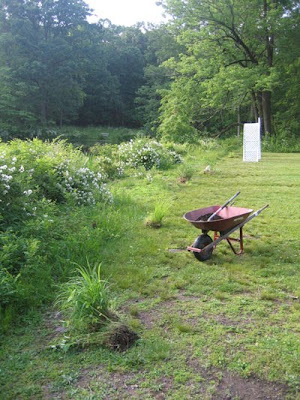 Several years ago, a number of us planted native wildflowers along this lawn edge, as part of a native plant workshop I was leading at the time. 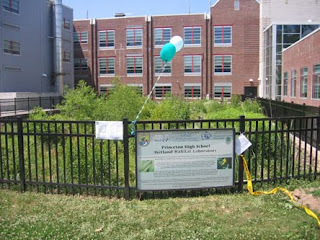 The plants were grown from locally collected seed. We must have been doing something right, because many of them survived. Over the last few weeks, the wildflowers have been making the journey over a little footbridge to the field visible in the distance, where they'll be safe from all the disturbance the lakes will experience over the next year. 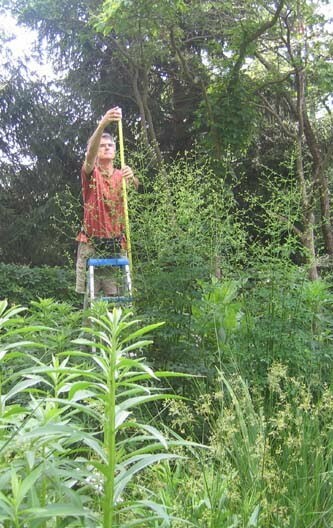 It's not easy to capture a tall meadow rue's size in a photograph. 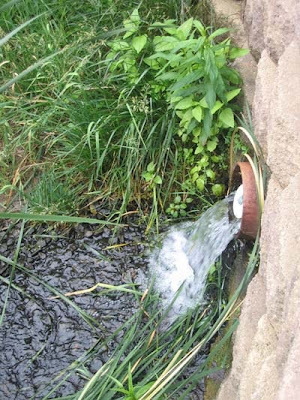 This native wildflower, found scattered in floodplains in and around Princeton, rockets upward in the spring, growing several inches a day, then sends out laterals to support a diffuse bloom of tiny, star-like white flowers. The tallest of the tall topped out at 105 inches--about 8.5 feet. 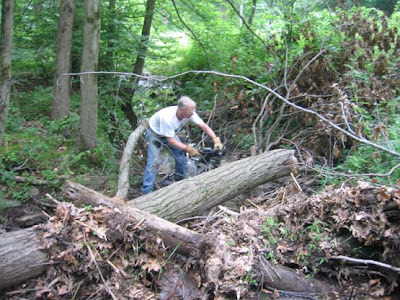 Clark Lennon, board member with Friends of Princeton Open Space and volunteer extraordinaire, is especially involved with clearing and maintaining trails at Mountain Lakes. On this day, I talked him into helping expedite not only the flow of hikers and joggers in Mountian Lakes, but also the flow of water down one of the brooks just upstream of the lakes. The fallen trees were obstructing storm flows that could undermine the streambanks over time. Bill Sachs and I pushed the cut logs up and out of the stream, leaving a clear channel. 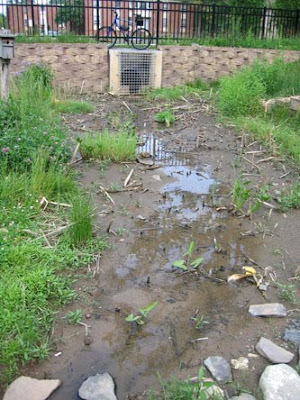 The little dam in the foreground suggests the spot was once a wading pool for residents of Mountain Lakes House. The final result: a winding stream that looks like it's been that way for thousands of years. The work of restoring, like they say about good writing, doesn't call attention to itself. Unless, of course, someone brings along a camera. To weed a garden requires knowing what to weed out. A weed is defined as "a plant out of place," which means that most any plant could be called a weed if it's not growing where you want it to. 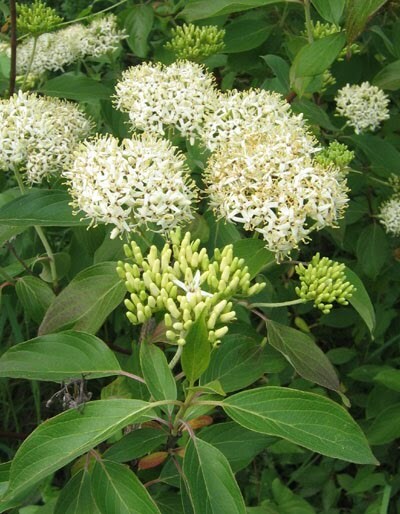 In this garden, the preference is for plants that are native to the region, have some attractive attributes, don't grow into trees that will shade everything else, and don't spread aggressively by seed or rhizome. So let's look at this photo of plants that popped up this spring. 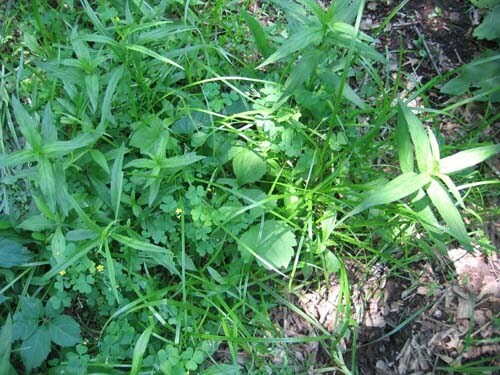 It's a mix of native and non-native species--Virginia creeper, willow herb, wood sorrel, nutsedge, violet, and one seedling of cutleaf coneflower. Since they're in the middle of a garden path, they all came out. Virginia creeper (five leaflets, lower lefthand corner) is a native vine that's fine for untended areas, but much too expansionist for a garden. Nutsedge (grassy looking leaves, light green) is a non-native sedge that pulls up easily but keeps popping up, requiring eternal vigilance. 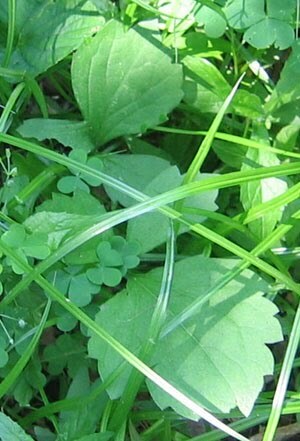 Wood sorrel (clover-like leaves) is a ubiquitous presence in gardens and greenhouses, with a little yellow flower and acid taste. Willow herb (narrow leaves in pairs) is a weedy native that sprouts abundantly from seed. It has a promising form but miniscule flowers. Violets are attractive and tasty, but not in a garden path. Only one plant was worth potting up for later use--the cutleaf coneflower seedling, its two broad, oddly lobed leaves visible here in a blowup from the original photo. If given a good place to grow, it will become a tall, stately wildflower bedecked with bright yellow flowers. The seedheads in turn attract a second wave of yellow, in the form of goldfinches vying for a snack.